on your 1st place win! PS Howd you get a pic from my place without me knowing you were here ? PS If I made it all those miles... all the way to you guys... I don't think I would be able to contain myself very long and you'd have to deal with your new house guest until I made you smile as much as you make all of us smile darlin'! Big hugs to you and Flash and Camilou... (hope I spelled that right?) Miss you guys and hope to be able to be back playing with everyone soon. We've ALL been missing you like crazy girl, hope to see you soon, I tried to pick up the "cocksucker slack" but it's not the same... only YOU can call peeps a cocksucker and they feel the love. 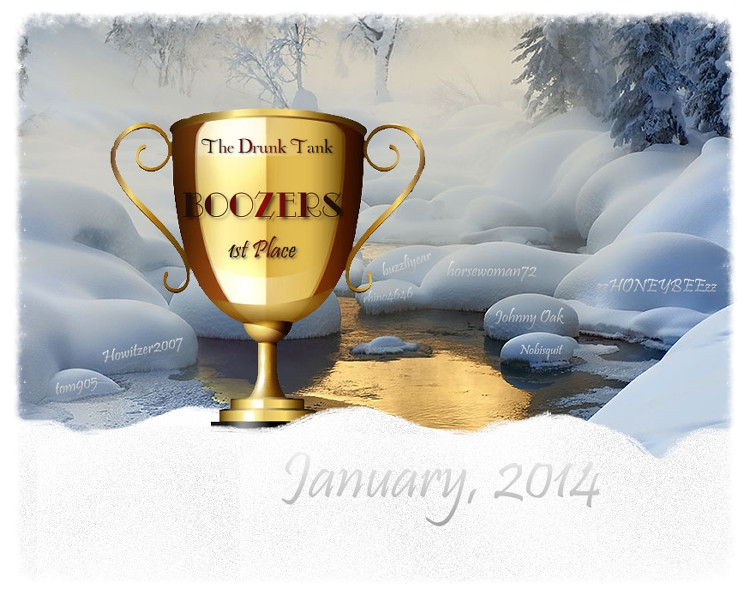 Yes I should give a great big thank you to all the Boozers for January. We took off and never looked back. All members should be very Proud to see their names on this beautiful trophy.